Safety should always be top of mind, whether at work, at home or out and about with friends and family. As the days become warmer and longer, we’ll be spending more and more time outside enjoying the weather. However, this means taking steps to be safe, while we’re also enjoying summertime activities. With June being National Safety Month, it’s a great opportunity to highlight and spread the word on ways you and your family can take steps to avoid and prevent any injuries or accidents. On a beautiful and warm summer day, few things seem more fun for kids (and sometimes adults) than jumping on a trampoline. Unfortunately, some thousands of children wind up in emergency rooms every year due to trampoline-related accidents, according to a study by the American Academy of Pediatrics. Be sure to take care while you (or your children) are playing on trampolines, as unsafe use can lead to severe spinal injuries, brain trauma and broken bones. Allow only one jumper at a time, be sure to use an enclosure net and check that there aren’t any holes or tears in the trampoline. Cooling off in a pool, lake or river is a fun and popular summer pastime for many of us. It can be easy to overlook some safety concerns when splashing around in the water. Before jumping in at the beach, lake, river or pool, don’t forget to check the water quality. Contamination levels can change from week to week, and while park and pool officials have a responsibility to monitor for water contamination, you can also find information on water quality on the United States Environmental Protection Agency beach advisory databases. To find out about a specific lake or river’s water quality, many of these reports can be found online by doing a quick Google search of the lake or river. If you’re swimming at a local pool, ask the pool staff. Many states, including Pennsylvania, have state rules mandating testing and related requirements they must follow in order to operate a public pool, including regular testing and monitoring of water quality and required chlorine levels. The Centers for Disease Control and Prevention report nearly 4,000 people drown each year in the United States from non-boating related incidents. That’s equal to about 10 deaths every day. Designate a responsible adult to watch kids while they’re in and around the water and ensure they are swimming and playing safely. And remember, pool floaties and foam toys are just that — toys. Do not substitute them for life jackets. Gardening is a great way to bring healthy and natural foods to your dinner table, but gardens can also bring some safety precautions to keep in mind. It’s vital to understand the products you’re using in your garden. Many fertilizers and pesticides can cause harmful reactions to your pets and family members. Keep those pesticides out of reach of children, and make sure they aren’t dangerous to anyone’s health. Also consider using organic fertilizers and pesticides in and around your garden and lawn. Read up on the local critters you have in your area; notably snakes and insects, like spiders and critters that can sting (such as wasps and yellow jackets). For snakes, learn about the ones you encounter and keep characteristics of the venomous kinds top of mind. If you’re working in your garden and you spot a snake you’re unfamiliar with, give it some space and consider investing in a snake repellent. You may already be aware of the typical hazards that come with homes. But with warmer weather, new hazards can surface. Before cracking your windows to let in some fresh air, make sure an adult is supervising open windows, even if you have screens installed. In most cases, screens do not prevent window falls. Sadly, 3,300 children require emergency treatment from window falls each year. The dangers don’t stop inside the house. Annually, 247,000 people are injured by lawn mowers. Flying objects at speeds of up to 100 mph can strike you or anyone around you while mowing. Before cutting grass, clear the lawn of any toys, woods, rocks or debris. Also consider wearing adequate eye protection to protect your eyes while you’re mowing. 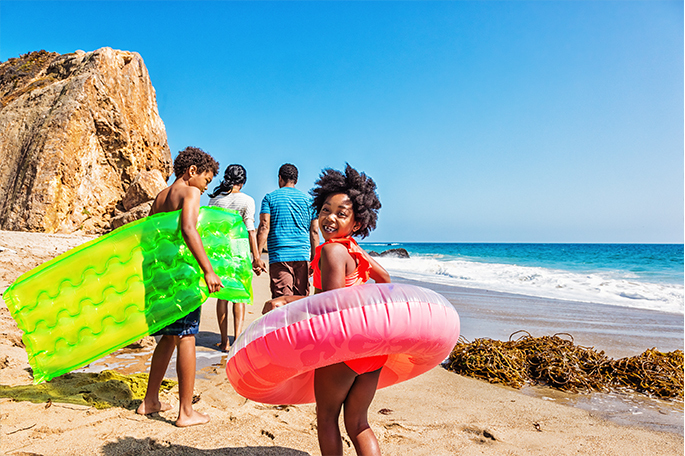 This National Safety Month, take some time to evaluate any potential warmer-weather safety hazards to ensure you and your family have a safe, fun summer. If you have questions about ways you can keep you or your family safe, reach out to our providers, who are experts on keeping everyone healthy, during the summer and year-round.